The CG features a modern take on a classic, offset style, shear. This sculpted Comfort Crane offset is a great option for any stylist or barber, looking for an ergonomic feel that isn’t too far off from a traditional haircutting shear. With all the benefits of its matching cutting shear, the CG 15 tooth texture shear brings a wide range of texture to your haircuts. Unlike a traditional notching shear, the CG doesn’t have teeth on the top blade. This allows the user to create a softer look, and avoids the choppy, blunt lines of a traditional texturizing shear. This texture shear allows you to pull out weight from the hair to give a natural, “lived in” look, and is a great tool for stylists to use expand their work. Made from Duralite™ Japanese stainless steel, the CG is available in 30 tooth and 15 tooth. 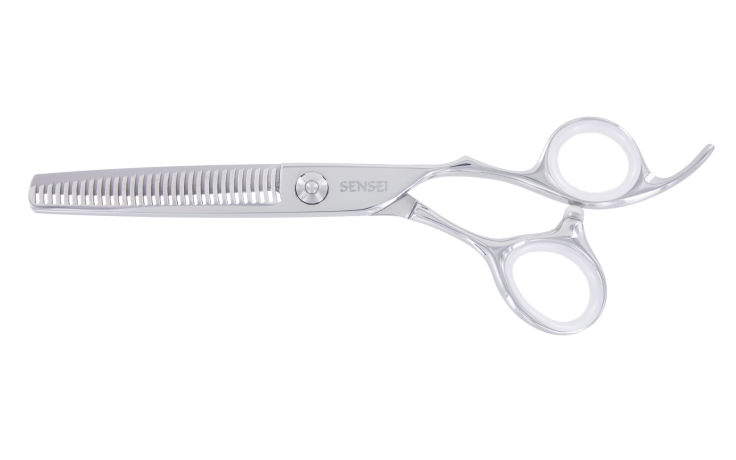 This shear features a sculpted, permanent tang which gives added stability and control. The flat line tension system gives it a sleek, low profile, while maintaining the benefits of an external tension system.